Florida isn’t called the Sunshine State for no reason. It truly lives up to its name because here we live a sweltering heat for most of the year, very much so that at times, it feels like living in huge oven. It really does. So rain in a place like this is truly refreshing. Its cooling effect is certainly much needed. It is a welcome respite to the daily humdrum of our lives, at least for me. There is something about rain that is soothing. In the bible, rain means a blessing. Rain symbolizes a fresh start, a new beginning. Where I originally come from (Philippines), there were only 2 seasons – the dry (summer) and the wet (rainy) season, with the latter being longer because really, it rains even in the middle of summer. As a teenager, I looked forward to the rainy season. For me, it meant curling up in my bed to read a good novel; and when my eyes grew tired, I would sit by the window to look at the rain drops drenching the ground while the sun-stroked leaves of the trees and plants are being quenched by its refreshing shower. It was during those rainy times that I learned how to daydream. Yes, as a girl, I’ve done my share of daydreaming. The steady sound of the rain pounding the roof, the occasional lightning that strikes and the roll of thunderstorm thereafter had a hypnotic-like effect that caused me to drift away into the land of fantasy. Most often than not, those fantasies were related to the romance-novels that I’ve read where I usually was the story’s heroine, or the love-interest of a gorgeous young Prince. Oh well, those were the days. Now back to reality. I made this dish a while back but I did this after a day of incessant raining. I felt that a warm soup getting home after work would be good for my tired body. 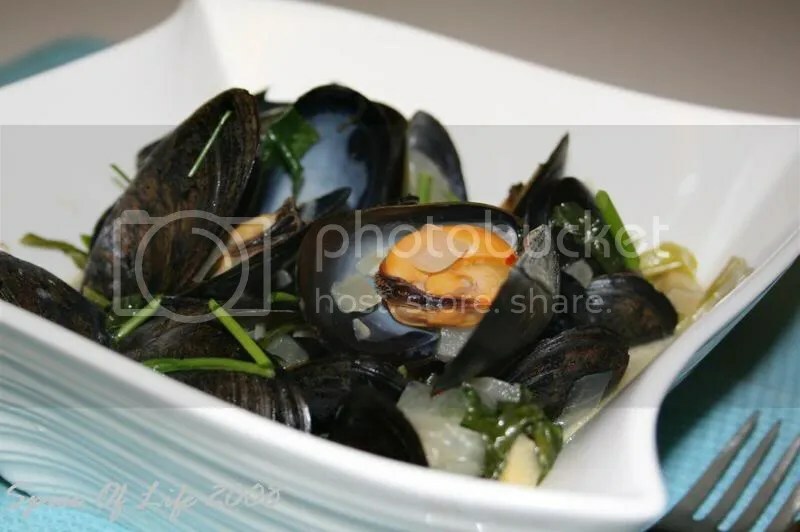 And I happened to have these mussels, which I originally purchased because I planned on making “baked tahong” (baked mussels) – a popular dish in the Philippines with these mussels. But then, since I wanted soup, I guess the “baked tahong” will have to wait for next time. Afterall, a girl is entitled to change her mind, isn’t she? 1. Rinse and scrub mussels. Using a pairing knife, remove the strings that hang from the shells and discard. 2. In a pot set over medium heat, combine wine, shallots, garlic, and salt. 3. Simmer for 5 minutes. 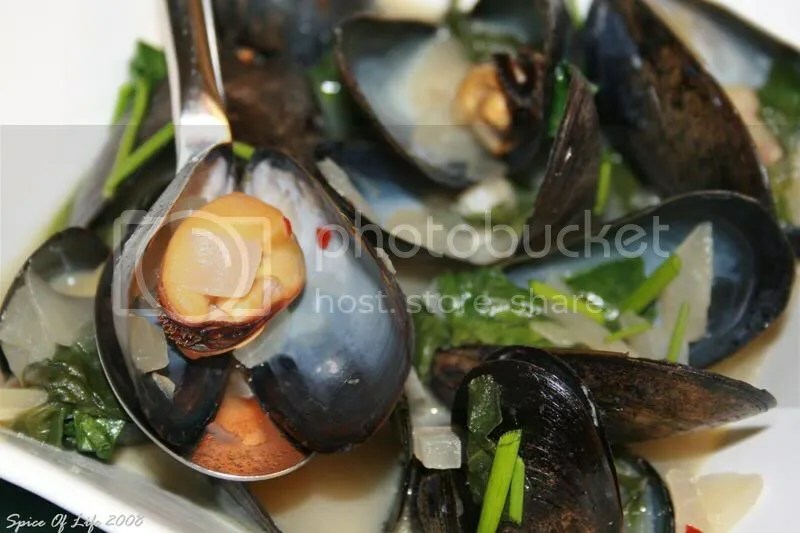 Then add the mussels. 4. Cover and increase heat to high. 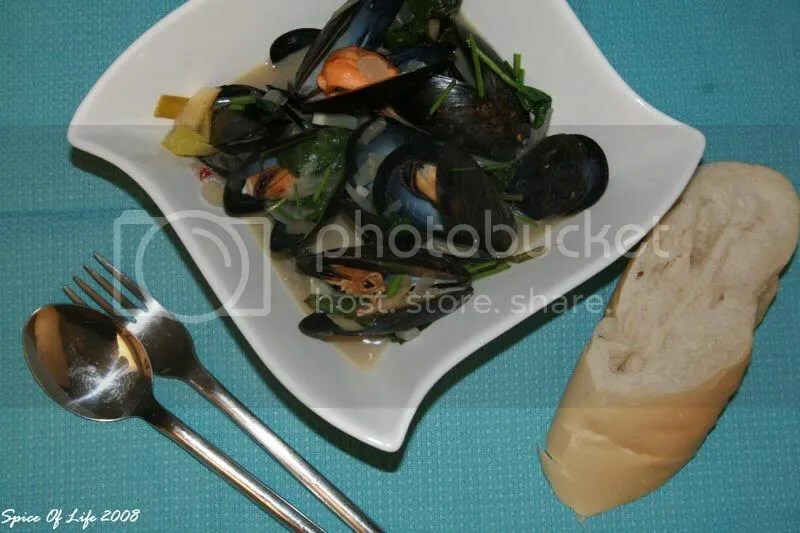 Cook until mussels are open. 5. Stir in spinach, parsely (or whatever herbs you want) and butter. Remove from heat. Discard any unopened mussels. 6. Serve immediately with a crusty bread. Garnish with chives. *NOTE: You can use whatever herb you like such as basil or tarragon.